Happy St. Patrick's Day everyone! I hope you have had an enjoyable day and are ready for some Pittsburgh Penguins hockey! The Penguins are starting a road trip tonight against the New Jersey Devils at the Prudential Center. They will go into this game and have a chance of hitting the big 40 mark in the wins category with a win today. It would be the eighth consecutive season for the Penguins, excluding 2012-13 season when the schedule was shortened (*cough more like the National Hockey League (NHL) couldn't get their act together *cough). The last time the Penguins faced the Devils, they came out with an overtime (2-1) win, which snapped a five game losing streak at the Devils' home arena. This road series could be just what the Penguins are looking for as they lost back-to-back games last weekend. They have only eight regulation losses on the road, which is the fewest in the NHL. Their last 12 games on the road, they are 8-2-2 and have a 1.83 team goals-against-average (GAA). The team's offense has been on fire recently, but that all came to a halt over the last two games. They have unfortunately lost two key players during this road trip. Both Evgeni Malkin and Patric Hornqvist didn't make the trip with the team (more details to follow). They will have to use the guys they have, which are still lethal. Captain Sidney Crosby has 13 points (four goals and nine assists) in the last 10 games, going back to the 21st of February. This is the third most in the NHL during that span. Crosby is tied for the most in the NHL with three goals against the Devils. He also has 71 points and is tied for second in points, along with Alex Ovechkin and Nicklas Backstrom (NHL points rates). Crosby is a huge factor in developing plays. Another key guy, which is on the first line with Crosby, is David Perron. He achieved 40 points for the fifth time in his career (17 goals and 23 assists). Perron is on pace to record 20 goals, 27 assists and 47 points. That is unreal for a guy joining the team late in the season and clicking right into the Penguins lineup. Also, Chris Kunitz has an active six-game point streak against the Devils, which amounts to two goals and four assists. I would also have to mention one of our road leaders, Blake Comeau. Comeau has three goals, three assists and six points in six games, since February 21. Luckily the Penguins are healthy (fingers crossed) on defense right now. They will have to stay sharp and hold down the fort. The offense will have new lines and be working things out, so the defense has to stay consistent. Thomas Greiss will be in the net, which will give Marc-Andre Fleury a nice rest. Greiss has had a good few games and it's great the Penguins can rely on him. Fleury needs the rest as the playoffs are nearing. On the injury front, Malkin's injury will keep him out for at least a week and at most 10-12 days. As for Hornqvist, it looks to be about a week. It will be good to get these two guys back in the lineup. 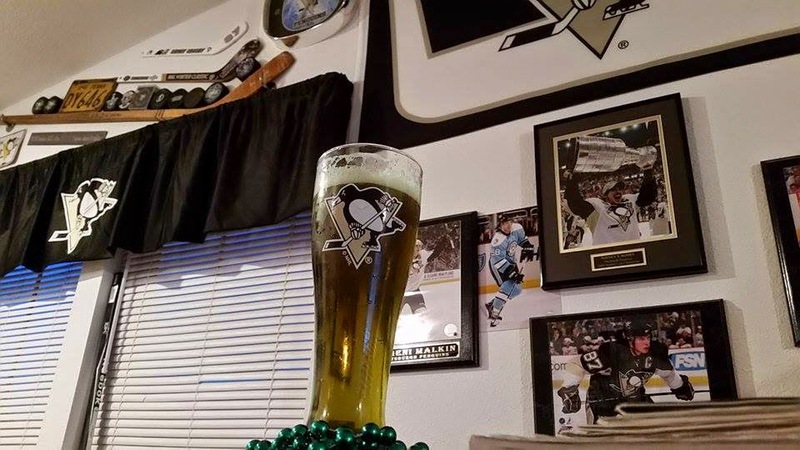 It's a St. Patrick's Day game and the Penguins are ready to top the Devils! Lets Go Pens! 0:48- Henrique Scores. Henrique scores an empty netter. 1:00- Letang is tripped up on the play and no call. 1:56- The Pens have been doing unreal stuff in the offensive zone! 4:42- Crosby has been setting up some big plays, but just need the finishing touches. He is really bringing it. 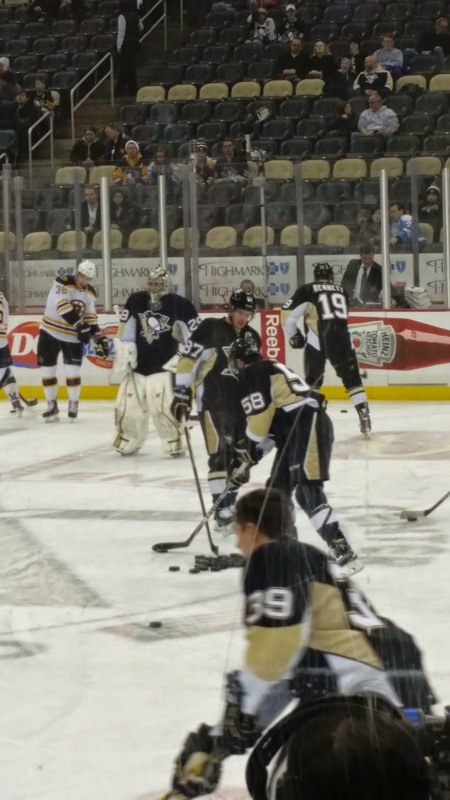 6:51- Comeau, Crosby and Letang work hard. Comeau snaps one, but Schneider makes the save. Great work by those guys! 8:59- Crosby gets another chance on a redirect attempt off of Letang's slapper. 9:50- Crosby slaps a hard one on net, Schneider with the save. Just a sick release by the Captain! 11:07- Greiss makes a nice glove save on Zubrus. 12:02- Downie shots, Spaling goes for the rebound and so does Bennett! Keep looking for those second and third chances! 13:06- The Pens successful kill another Devils power-play. 15:06- Another Devils power-play. Winnik sits in the sin bin for slashing. 16:19- Nice start by the Pens. Comeau with a few chances, looks really good. 20:00- Another 20 minutes are on the board and time for the Pens to push back! Have to get to the second chances and pester Schneider! Lets Go Pens! 0:00- Second period ends and the Devils take the 1-0 lead over the Pens. 0:17- Downie is cross-checked in the slot area. He is bent over in pain on the bench. 1:33- The Pens have been crashing the net, but Schneider has been sharp. They are just missing a finishing touch on their chances. 3:35- Josefson Scores. The Devils get another 2 on 1 chance and this time they make the Pens pay. Josefson rips one past the blocker of Greiss. 1-0 Devils. 4:27- The last few minutes have been nothing special. Both teams get the puck in the zone and then it's clear. This cycle continues on and on. 5:51- Back and forth hockey going on right now. 7:43- Great penalty kill by the Pens and Perron is set free! 9:43- Devils will get a power-play chance as Perron sits for holding. 10:38- Now the Devils are getting some extend pressure. The Pens are getting tired and the Devils were able to get a second unit on. 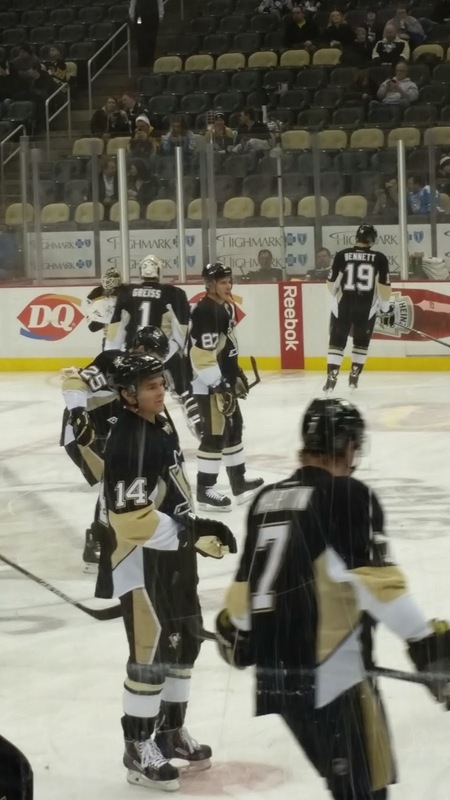 12:44- Kunitz and Downie team up and get right in the face of Schneider. 15:43- Ruutu receives a pass from behind the net and is right on the doorstep. Greiss comes out to make the save! 16:34- The teams are made whole again. Couple of good chances for the Pens on turnovers by the Devils. 18:34- Winnik goes for embellishment and Fraser for tripping. 4 on 4 hockey time. 20:00- Second period is underway! The Pens need to finish their opportunities and get on the board first! Lets Go Pens! 1:02: Great rush by the Pens! Lovejoy's slap shot is saved, Winnik tries to put home the rebound, bu Schneider is up for both challenges. 1:22- Only one shot in the last seven minutes of play. This game has become more of a close checking game. 3:29- Solid start for the Devils, who have been pressuring the Pens. Greiss stepped up to the plate and the Pens are starting to get their footing back. 5:41- The Pens are getting some more offensive zone time as the period progresses. 8:36- Crosby takes a perfect pass from Kunitz and gets in one-on-one with Schneider, who robs Crosby with a pad save! 10:52- Devils getting a lot of chances and shots. The Pens are having trouble leaving their zone and sustaining any offensive zone pressure. 12:44- The Pens are playing with fire as Greiss is holding back the Devils...for now. 15:25- The Devils get a 2 on 1 chance. Zubrus holds the puck and Greiss makes the pad save. Greiss looks in the zone. 18:14- Greiss with a few good saves to start this one. Looks sharp in net, early in this one. 20:00- The puck has dropped and this game is on! The Pens have to come out with speed and put the Devils on their heels early! Lets Go Pens!